Boeing has announced that, after 16 months of development, it has delivered a "reversible" fuel cell for the U.S. Navy that stores energy from renewable sources and generates zero-emissions electricity. The Solid Oxide Fuel Cell (SOFC) system, which can generate 50 kilowatts (KW) of power, is the largest of its kind and can use electricity from wind or solar power to generate hydrogen gas, which it then compresses and stores. The SOFC system after being installed at the Navy Engineering and Expeditionary Warfare Center in Port Hueneme, Calif. When power is required, the system operates as a solid oxide fuel cell, consuming the stored hydrogen to produce electricity. 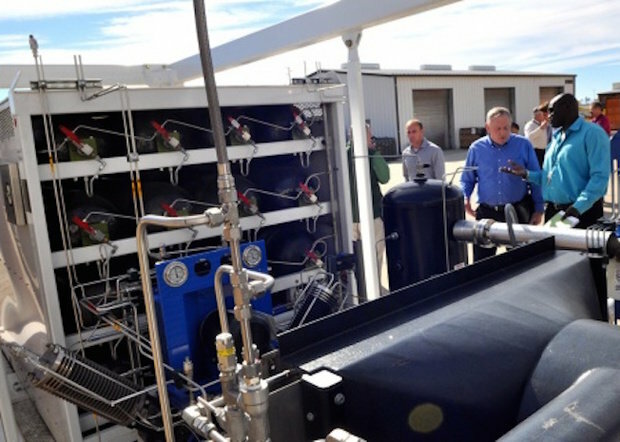 The SOFC system, being tested as part of a micro power grid at the Navy's Engineering and Expeditionary Warfare Center (EXWC) at Port Hueneme, Calif., is scalable to 400KW. "This fuel cell solution is an exciting new technology providing our customers with a flexible, affordable and environmentally progressive option for energy storage and power generation," Lance Towers, director of Boeing's Advanced Technology Programs, said in a statement. How a solid oxide fuel cell works. 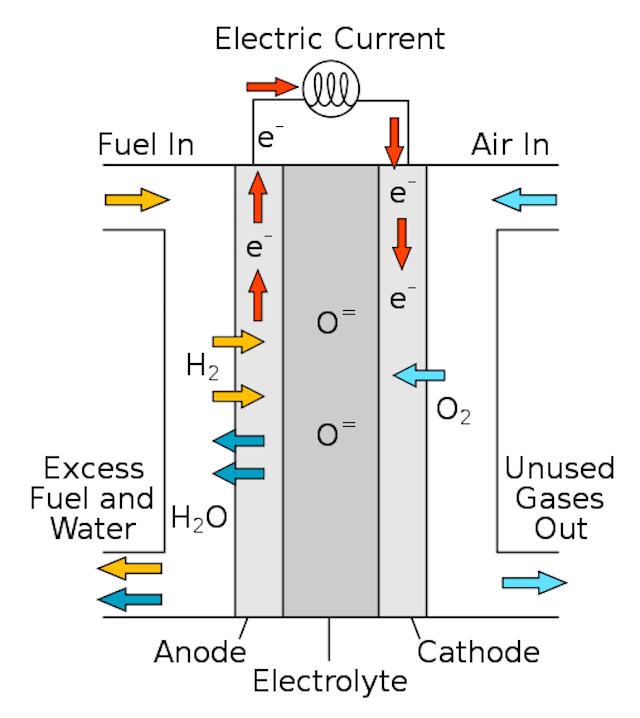 A fuel cell is a device that uses stored chemical energy (in this case, hydrogen) and converts it into electricity. The SOFC device uses solar power to strip seawater of its hydrogen molecules through electrolysis. The hydrogen gas can then be stored and later used in the fuel cell stack where it electrochemically reacts with oxygen in ambient air to produce electric current, heat and water. The SOFC manufacturers include Boeing in Huntington Beach, Calif. and Sunfire in Dresden, Germany. The technology is unique in being able to both store energy and produce electricity in a single system, making the technology "reversible," Boeing said. The SOFC generator has been installed on a microgrid at the Naval base and will be tested to determine its uses when there is no access to power from a grid. "The SOFC is a most promising technology for both remote islands and expeditionary applications," Michael Cruz, EXWC project manager, said in a published report. "Combined with a solar photovoltaic array, a SOFC system generates electricity, potable water, and heat with only two inputs, sunshine and seawater."